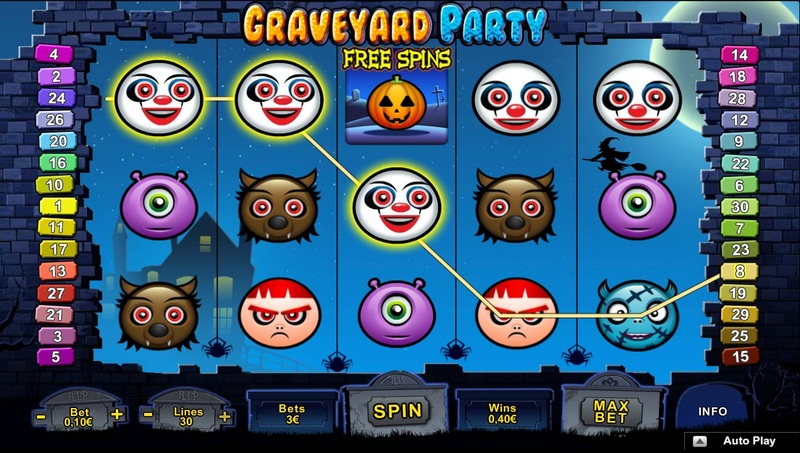 Let me present you a teaser of a truly spooky as well as amazing new video slot game from NeoGames that will soon be available at Winnings – Graveyard Party! NeoGames is one of the most trusted and popular provider of top class online gaming entertainment, no wonder that more and more players actually decide to play their range of games at Winnings.com. Also Halloween is still about four months away, this video slot with 5-reels and 30-paylines will keep you on the edge and entertained at the same time. Imagine being at a Halloween party and watching all kinds of horror movie classics; playing Graveyard Party just feels like that. The reels feature various Halloween symbols and characters that all come alive when the reels start spinning. Watch out for the Mystery Pumpkin feature that can reward you with up to fifteen free spins. With Scatter symbols you might be even lucky enough to help an undertaker in selecting graves during the bonus round. Pick up cash while you assist him and reveal multipliers as well. This latest addition to the portfolio of Winnings.com is perfect for spooky, entertaining and rewarding gaming sessions! Like most other video slot games from NeoGames this one is well designed and even playing it just for fun in the demo-mode is quite entertaining. Don’t forget when you sign-up for an account at Winnings.com to take advantage of the 100% deposit bonus offer or the free £5 no-deposit bonus to play and win right from the start!